It’s 2018. Sicko is doing a reunion show. I’m flying out for it. Top Drawer Records is active again. I can’t really handle this combination of events. The Sicko performance is part of the two-day Seattle Pop Punk Festival, January 19th and 20th at Highline. You should do this. You still have time. I was a bit late to the party with Sicko (a friend introduced me in 1997), so I never got to see them play the first time around. Time to rectify that. If that weren’t enough, though, Top Drawer decided to take it one step further, reviving the (tragically) lost art form of the compilation. 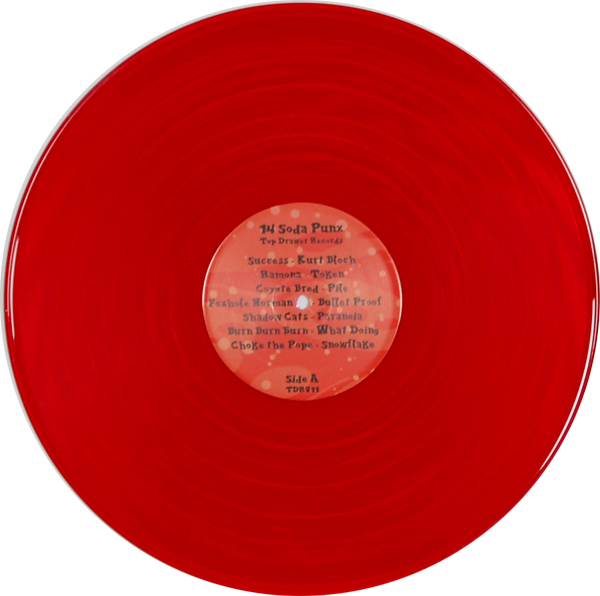 In conjunction with the festival, they are releasing the 14 Soda Punx record, limited to 500 copies on red vinyl (pre-order here). This is a 23-year-later sequel to the classic Top Drawer 13 Soda Punx compilation. Top Drawer and Sicko have always excelled at promoting the frequently overlooked Seattle pop punk scene, which has always existed – it shared space with the ’90s grunge boom era, and never achieved the fanfare. The Fastbacks managed to keep one foot in both worlds, but they were mostly alone in that – other bands were seemingly either in one camp or the other, and there was little overlap. Top Drawer planted the pop punk flag and flew it proudly while everyone else was perfecting their power chord/feedback balance. So here we are. There is still pop punk in Seattle, and Top Drawer has come out of retirement to once again, with a small army of punk bands, to stake its claim to that segment of the Seattle music scene. And it’s good. 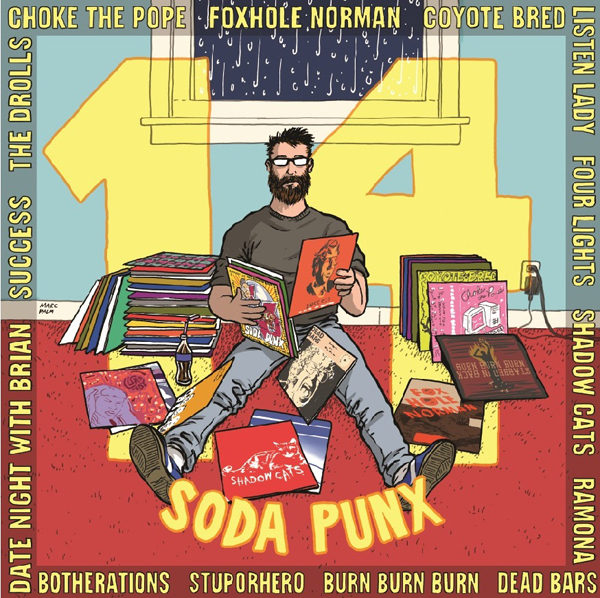 14 Soda Punx is a fascinating walk through a variety of pop punk styles. Parts of the record are like walking through a mid-90s Warped Tour lineup…you can hear influences all over the place from the bands of that time. Since Top Drawer has brought back the compilation with authority, I am going to revive yet another lost art form: describing tracks on a comp by drawing comparisons with other bands. There are highlights all over the place, but one real standout for me is the opener. The record kicks off with a strong entry from Success called “Kurt Bloch,” a not-super-subtle musical love letter to the Fastbacks. It’s got Weston/Armchair Martian-style guitar work and vocals, which equates directly with happiness. It’s scientific fact. Really catchy and solid. Ramona’s “Token” follows, which is also fun – this one kind of sounds like one of the early Rancid tracks sung by Matt. Or something by Tilt. Or both together. Shadow Cats bring us “Paranoia,” which sounds like a Fastbacks love child. Fantastic hooks and Hi-Fives-like vocal progression. Head-bobbing and infectious. Burn Burn Burn’s “What Doing” takes us on a detour from 14 Soda Punx and lands us in a ’90s Fat Wreck comp. Great energy. A couple of tracks later, after we find our way back from Fat Music for Top Drawer People, we crash into something straight out of Husker Du – the Botherations track “Amor Perdido.” I love the emotional intensity of this song. Intensity – whether in music or obvious in vocals – is a feature I am realizing more and more matters to me in new music. At this point, we reach the brightest highlight for me on 14 Soda Punx. I will say that Top Drawer did its best to avoid making this record/festival a celebration of Sicko and its members’ new bands. I knew Denny’s new band was on here, but I did not know which band it was when I listened to it. When the Drolls’ song “Getting Old” kicks in, it takes all the guesswork out of the equation. This song brings me back to vintage Sicko. Great stuff. Ean’s new band, Date Night with Brian, follows with the characteristically catchy pop song, “Get It In.” The song is excellent, and it is a good follow up to their debut EP that came out in 2017 (which you should go check out from Top Drawer. It’s on Spotify, too). 14 Soda Punx closes with Dead Bars, probably the best-known of the bands on the record. They contribute the hysterical “Krist Novoselic’s New Band,” which…well, just go listen. Top Drawer has returned with a vengeance, and it’s what we need in 2018.